Six feet of “all man.” Six feet of breeding and polish. Six feet of acting ability or such an extraordinary high caliber that he is known as Hungary’s best actor. Such is Bela Lugosi, who has been in New York four years; four years physically and two temperamentally. Now he has found it. For the last two years he has been seen on the stage and in pictures. Somebody of Broadway saw him in one of his native exhibitions with the result that he stepped into the featured role of the play, The Red Poppy. He scored a decisive success in that production. Then came pictures. The Silent Command for Fox. The Rejected Woman, Daughters Who Pay for Banner, and That Midnight Girl for Chadwick. His ability is finally telling. Billy La Hiff, genial host of The Tavern, thought so much of his guest that he lodged the two of us at one of those exclusive corner tables, personally supervising the comings and goings of the waiters. “There is one thing that stands out in reference to the making of picture productions here,” said Mr. Lugosi with that continental accent to his words that makes them sound highly distinctive, “that is, here personality counts more that ability. I say this with no intent to criticize or to decry. But naturally such a proceeding struck me peculiar when in Hungary and Germany skill ability count for everything on the screen and stage.” “Possessing a good reputation in Hungary, I naturally thought that the going would be easy in New York. But it was not. I may say it is not.” “I received an offer of a contract to appear on the screen. I was playing in a stage production at the time and, acting on advice, I named a figure that doubled my stage salary when I gave my answer. A Mad Producer “The producer went mad. He claimed that I was unknown. That I wasn’t worth that much. After he had publicized me, yes, perhaps. But not then. But I was told to double my stage salary when talking to picture people. I didn’t know that years of stage training and study counted for little.” We have placed a side bet with ourself that Lugosi will some day pass that salary mentioned to the picture producer. The actors tells some interest things about pictures in Hungary. There are about 50 producing companies there. And 12 of them make good pictures. They are not the type that register well over here, he says. They are behind the Germans in technique. The war left them in even a greater predicament as regards equipment for production. They are beginning all over again where they left off in 1914. Lugosi plays the heavy inThat Midnight Girl. He doesn’t mind what part he plays as long as it gives his abilities a proper chance—he is a true actor. He thinks Emil Jannings a great performer. He has played with him in stage production on the Continent. “Jannings doesn’t have to come to America to work,” said Lugosi, “for he gets the same salary he could get here in Germany. He is paid in gold dollars. 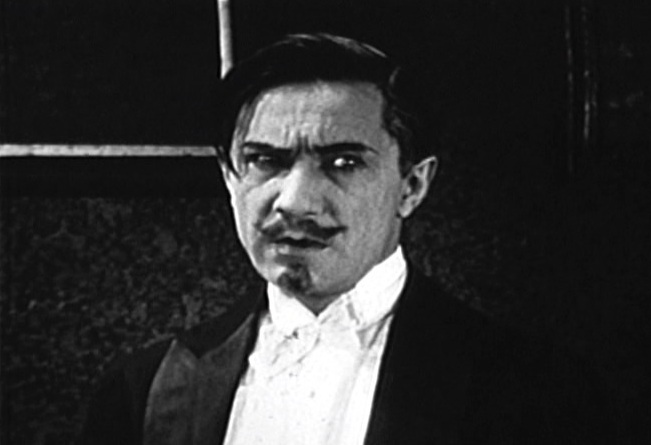 He has had plenty of offers to come here.” Lugosi’s favorite actor on the American screen is Adolphe Menjou. He likes him because he never appears to be taking direction. He is natural-born actor. Naturally, such a character appeals to Lugosi as he is, above all things, a natural-born actor himself.